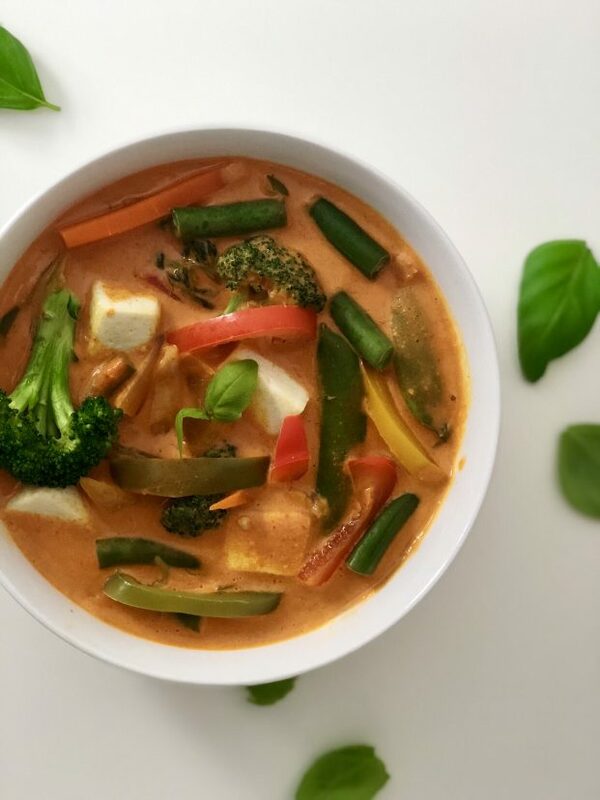 Thai curry is a bowl of creamy sauce of coconut milk with gently spiced curry paste, loaded with crunchy veggies and basil leaves that secretly add their flavor. Sounds appetizing, right? Red Thai Curry with brown rice is a delicious, wholesome meal and is quite simple and quick to make. The base for this recipe is the red curry paste, which I buy from the store. I have tried the Thai Kitchen and Maesri brands, and they both go really well for this recipe. Once you have the paste, all that you need to do is drop the veggies in the sauce and simmer it for 5-6 mins, and you have your soothing curry ready to go. Try this flavorful and satisfying one-pot meal and I am sure it will go on your favorite and quick recipe list. Prepare your tofu in the meantime before you start with the veggies. Wrap the tofu block in layers of kitchen towel and put a plate or cutting board on top of the wrapped tofu. Let it settle and drain water for 15-20 mins. Steam all the veggies together. I like to steam the veggies and broccoli halfway, in a way that they are not too raw and not too cooked. Blend together the coconut milk and peanut butter in a blender or you can also whisk them together. Heat a wok or a pan and add the Thai red curry paste, ginger-garlic paste and saute for a minute. Add the coconut milk and peanut butter mixture, and stir this mixture with the curry paste. Let it simmer while stirring and bring to a boil. By this time your tofu must be firm, unwrap the tofu from the kitchen towel and cut it into cubes. Add the steamed veggies, tofu cubes and basil leaves to the mixture and stir everything together. Add salt as per taste and cayenne pepper if you want the curry spicy. Finally, add the brown sugar and lime juice and heat it through a couple of minutes. And you are done! Garnish with fresh basil leaves, serve with brown or white rice. Enjoy! You can also saute the veggies in 1tbsp of oil if you like. I like to steam my veggies, as this is a great way to keep them oil-free and maintain their tender color.